Have you ever wondered why your emails go to Spam folder? How do we know the delivery rates and how many recipients open our emails? With the help of transactional email services, these problems are solved completely. In this guide, we’re going to review and compare the best free transactional email services. Normally, we use an utility called sendmail to send emails from our websites to customers / readers. This utility is installed on most hosting or servers (but not all). If you’re using WordPress and don’t install any plugin for sending email, that means you’re using sendmail. However, using sendmail has a big disadvantage: your emails are going to Spam or Junk folder. And your recipients might ignore them or don’t read them. The problem of marking an email spam depends a lot on your server IP (whether or not it’s blacklisted, or even if it’s not blacklisted but not in the whitelist, your emails still can be marked as spam) and how you setup your server / domain (SPF or DMIK record for example). These things are quite complicated and beyond the technical capability of most users. Moreover, using your host or server to send emails also affected by the rules of hosting provides. MailPoet has made a complete list of hosting providers with their sending email limits. If you’re sending many emails (like newsletter), you should think about another solution. One of the popular solution to send emails from websites is using Gmail SMTP. If you use WordPress, there are many ways to connect your WordPress website with Gmail. We recommend using Gmail SMTP because it’s compatible with latest Gmail API and using OAuth 2.0, which is secured. You can also use other popular plugins such as WP Mail SMTP or Easy WP SMTP. However, Gmail limits the number of emails sent up to 200 per day and 20 per hour. It’s plenty for most people, but if you want to send newsletter, the numbers seems to be low. Another disadvantage of sending from Gmail SMTP is all your emails, no matter what email address and from name you use, Gmail always shows up the avatar and email of your Gmail account that you use for SMTP. This might affect your company branding where you want to show your company avatar instead. To avoid the disadvantages above, we should use a transactional email service. To understand about this kind of service, we need to understand about transactional email first. For example, if you’re using WordPress theme EightyDays by GretaThemes, and on that blog, you allow your readers to subscribe to comment. So, when there is a new comment, they will receive a notification email. That email is a transactional email. Or if you run an online shop, the website automatically sends an email to the customers when they place an order, letting them know about the order content. That email is also a transactional email. As said above, sending email the normal ways has a many cons than pros. And transactional email services were born to solve these problems. You’re likely not limited by number of emails by day or by hour. Some services like SparkPost allows you to send up to 150,000 emails per month for free! All transactional email services are optimized to send emails and have whitelisted IPs. Your emails are always send to recipients’ inboxes! The transactional email services have reports to help you see the insights of your emails: how many emails are sent, what is the delivery rates, how many are opened and clicked, etc. This information is very helpful to run A/B tests and optimize the click-through-rates for your business. Pricing: You can sign up a trial account on SendGrid, which can sends up to 40,000 emails free for 30 days. After the trial account expires, you can send up to 100 emails / day free forever. Updated on 07/15/2017: SendGrid no longer offers free plan. So I removed it from the list. Updated on 03/19/2018: SendGrid still offers free plan. You can sign up a trial account on SendGrid, which can sends up to 40,000 emails free for 30 days. After the trial account expires, you can send up to 100 emails / day free forever. SparkPost is the world’s #1 email infrastructure provider and the most performant email delivery service available. Their customers send over 3 trillion messages a year, more than 25 percent of the world’s non-spam email. They provides proven highest inbox delivery rates, easy setup and launch, and the most comprehensive analytics and insight. SparkPosts has a free plan which allows you send up to 100,000 emails / month (updated 9/19/2017: SparkPosts now offers only 15,000 emails / month for the free plan). However, you can send only up to 750 emails / day if you don’t add your credit card (it’s only charged when you send more than 100,000 emails /month). One advantage of SparkPost is the setup process is easy and simpler than other services. Pricing: Free for 15,000 emails / month for developer account which can send testing emails in sandbox mode. For sending real emails, you need to pay at least $9 for per month for 50k emails. Updated 9/19/2017: SparkPosts now offers only 15,000 emails / month for the free plan. Updated 2/21/2018: The free plan of SparkPost (developer account) offers 15k emails / month, but it works only in sandbox, which means you can use it for testing purpose only. NO real emails are sent. SendPulse is a marketing automation platform at its core. Having multiple channels at your disposal, you can reach your customers via Email, SMS or Web Push Notifications as well as recently introduced messenger marketing. When it comes to transactional emails, with SendPulse you can send up to 12000 free messages per month via SMTP or API. The dedicated IP address – for better sender reputation. SPF/DKIM authentication – spam folder prevention. List of unsubscribed contacts – emails are not sent to unsubscribed users. Open/Click tracking – email marketing statistics. WordPress: SendPulse official WordPress plugin. Pricing: A free plan comes with 2,500 subscribers and 15,000 free emails. Then, you have 2 options to choose from: monthly/yearly charge with over $23 per month, or pay as you go with $32 for the next 10,000 emails. Forever free web push notifications plan is a very pleasant bonus and it gives you an opportunity to drive visitors back to your site. Built by the Rackspace team, already known for reliable hosting, Mailgun is a reliable email service for developers. Not only can it deliver your emails well, it even includes email validation features to check and make sure you’re sending emails to valid addresses. You can send emails the way you want in Mailgun, with isolated sub-accounts for each domain you add, giving you an easy way to manage all of your email lists separately or manage client emails along with your own. There’s batch sending features to personalize emails, detailed analytics and logs, and a powerful parsing engine to turn incoming emails into JSON and route it where you want. Pricing: Free for 10,000 emails / month. Their pricing remains one of the most cost-effective options as you scale up. Their user interface is very clean, and in addition to transactional email you can also use SendinBlue for normal email marketing campaigns, marketing automation, and transactional SMS messages. Pricing: Free for 9,000 emails / month. Pricing: Free for 62,000 messages / month if you are an Amazon EC2 user. Being one of the leading transaction email service provider, Mailjet has a good price and great features to customize emails to clients in mass scale fairly easily. When sending thousands of emails the ability for customization is essential to avoid being flagged as a spam mail. One of the great features is that the customization for each email is individual. The ability to do split testing is very helpful as well. The templates included were also very helpful to build professional looking emails. Pricing: Free for 6,000 emails / month. At Postmark, you need to buy credits to start sending emails ($0.25 for 1000 credits, 1 credit = 1 email sent). Postmark guarantees the delivery time below 10s and 100% of delivery rate. You’ll get 45 days of searchable history, so you can see the full contents of the emails and pinpoint why they bounced. Pricing: Free for first 25,000 credits (= 25,000 emails). With the reliable and scalable cloud-based email infrastructure, Pepipost helps hundreds of businesses send millions of emails every day without any hassle. Pepipost follows the best delivery guidelines, protocols, and industry standards to fight against spam and make sure that emails get delivered and reach recipients’ inboxes in the blink of an eye. Pepipost offers an easy-to-use interface with precise real-time data and useful analytics. Pricing: Free for 30,000 emails / month. Update 03/19/2018: Pepipost now increases the limit for free accounts to send 30,000 emails / month. Elastic Email is all the Email marketing and delivery tools you need to communicate with your customers. Use Elastic Email as your outbound SMTP server to improve your delivery rates and seamlessly scale from 100 emails to 100 milion per month on our ultra-fast global infrastructure. Elastic Email provides inbound notification, A/X split testing and private IPs. There’s no doubts that using a transactional email service is better than using your host or SMTP to send emails. 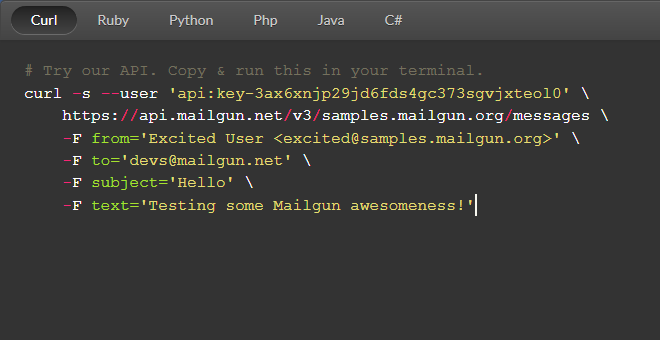 Here at GretaThemes, we use MailGun and very happy with it. The email delivery rates is very high, the integration is quick as it has WordPress plugin. How do you send emails? Let us know in the comments. I was just about to sign up for a SendGrid account, then saw that it was no longer free… so needed some info on where to turn. This post is EXACTLY what I’ve been looking for! The links to the WP plugins are especially helpful. Really appreciate the time taken to put this together for clueless numpties like me. Thanks! SparkPost not only provide 15K emails/mo. 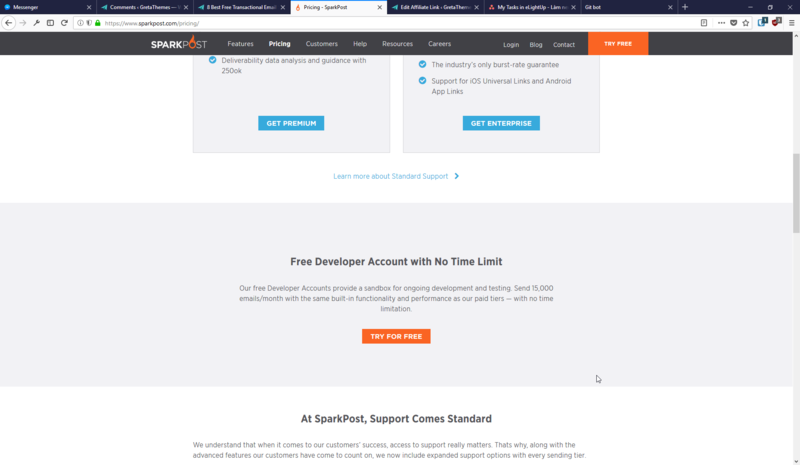 SparkPost No longer has a free version. Please update the article. Anh Tran is wrong. The truth is that SparkPost with the free developer account you can send up to 15k emails per month, in a _sandbox_. This means that you’re not really sending out emails with this type of account. Send up to 40,000 emails for 30 days and 100 emails/day free forever with our trial—no credit card required. Dear users, don’t spread wrong words if you haven’t read the conditions carefully. Thanks for the info. The information in the post is right at the time of writing this post. However, SparkPost and Sendgrid changed their policies. SendGrid only offers free emails in the trial period. After that, you need to pay to continue using the service. Regarding SparkPost, I will update the post. Thanks for letting me know. @Hans Wurst I haven’t been able to find anything on Sparkpost’s website that says the emails on the free developer plan don’t actually get sent. I agree that the wording here (https://www.sparkpost.com/docs/faq/free-accounts-for-developers/) is ambiguous, but I’m pretty sure that you can still send, based on this (https://www.sparkpost.com/blog/updated-service-plans/) blog post from the same date. Do you have experience with signing up and not being able to actually send emails out on the developer tier, or is that based solely on the use of the word “sandbox”? I’m also going to be reaching out to them for clarification on this.